Sometimes an individual or group has to stay in the outside for a longer period of time from their hometown due to professional, personal or medical reasons. Long-term stay in the hotel requires huge amount of money which often incur excess cost for the traveler. Therefore, travelers prefer to stay in the renting apartment to being it economical. However, staying in the apartment is also sometimes costly which comes from recurrent apartment lease fee. The idea of Extended stay hotel was developed in late 80s to attract such guests to give quality service at low rate. Travelers who are seeking for economical lodging facilities and high quality for a long period, extended stay hotel or long term hotel is an excellent option. Though it is comprises of very small area but considered as one of the most important segments of hotel industry. Now a day, these hotels are gaining much popularity among the travelers specially the business travelers due to several attractive features. Other travelers like, corporate staffs on lengthy consignment, trainees, long-term vacation traveler, skilled laborers, subcontractors etc. also prefer extended stay hotels as their temporary living place. Traveler who are in search of a perfect home away of home must find extended stay hotel as their ultimate destination. The room of these hotels may not like their own home but it gives more comfort & enjoyable feelings than any other hotel. Extended stay property was first established by a joint effort (an hotelier named Jack Deboer and Marriott Corporation) after the establishment of Residence Inn brand in USA (1980). Eventually this industry has expanded its business especially within the year between 1995 and 2002. Being a part of the hotel industry extended stay hotel represents about 10% of the whole hotel market. All-Suite Hotel: An urban product, which provides all those facilities that are available in first-class hotel (Example- Residence Inn). Serviced Apartment: Like all-suite hotel, it is also considered as an urban product but the services provided by serviced apartments are limited comparing to the all-suite hotel (Example-Quest serviced apartment). Accommodation facilities can vary from budget to deluxe. Apartment Hotel or Aparthotel: Commonly referred as resort product, but also regard as an urban product (Example: Space aparthotels). The level of services can be ranged from budget to deluxe. Though serviced apartments are regarded as corporate housing in USA, but called as boarding houses in Germany. However, in Europe this property is commonly known as apartment hotel (or aparthotel). Even the term (extended stay hotel) is also used in describing single apartments in some Eastern European cities. Beside the different definitions or term, the development patterns are also different in USA and European markets. Such as, in USA these properties are usually located in the suburban areas which are close to suburban office parks, hospitals or senior residence communities with a view to get high volume of profit especially from the business travelers. However in Europe, extended stay hotels are positioned in the city center to attract all-season tourists. Locating near to corporate offices, commercial parks or any other marketable producer. Easy availability of nearby restaurants, cafes, shops. Accesses to international schools for the temporary relocate travelers. Easy availability of public transport. Extended stay hotel provides a homey (home like) atmosphere with all those facilities, services and amenities that could be required by a guest for a long-term stay in one locality or community. Public areas are usually limited to a small reception/lobby and, potentially, one small communal lounge/breakfast area. Serviced apartments in urban locations may provide a small meeting room or meeting rooms. Direct telephone/fax lines and so on. However, very few extended properties have their own food and beverage outlets. Though some of the properties can provide complimentary breakfast, but most often, guests have to depend on the nearby restaurants. These types of hotels determine their room rate based on the duration of the guest’s stay as long term stay reduce the need of frequent room selling. Most extended stay properties provide discount in room rate for those guests who are staying for longer periods. Signing an apartment lease contract is not a wise decision for those guests or travelers who are unaware of their duration of stay. These properties are very popular in USA among middle age spouses who want to get all facilities together including shopping, recreation, food and beverage during their vacations. Sometimes people have to stay in the hotel due to some personal reasons (such as family conflicts, renovation of house). Extended stay hotel is an excellent option for such people for meeting impermanent household needs within limited budget. Some professional trainers are hired by large companies to train employees for long term within a specific community. Therefore, they often have to stay in the extended stay hotel within that required community. The long term guests generally have different requirements than usual guests. Extended stay properties are able to fulfill all requirements that are needed for longer period staying. As ultimate goal of the extended stay hotel is to attract the guest as other hotels do, thus they are trying to serve all those facilities that are provided by a standard hotel. But still these properties are lacking behind due to some restrictions or challenges triggered by secondary market of hotels. Moreover, the lowest rate of long term guests and its cheap fare may create challenges by incurring operating expense and low profit margin. This segment got popularity in late 90s but due to the terror attack of September 11, 2001 like all other hotel properties this particular business also experienced fall of guest coming. Luckily situation has been developed from 2005. However global recession in many countries sometimes impact negatively in this business. Such hotels need to provide huge facilities like all suit hotels but due to its unique nature it can’t charge high which makes things hard to make profit. The biggest challenge for managers and investors to make profit with low ADR when they can’t make huge profit in negative economic activities worldwide. 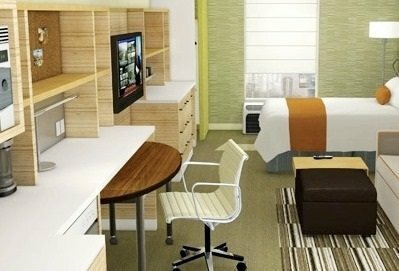 Another bigger challenge that extended hotel industry experience comes from newly booming apartment industry that attracts extended stay travelers with many facilities at low price. Also other types of hotels like all-suite hotels or commercial full service hotels are trying to attract such guests with their specialized packages. The other challenges that are encountered by an extended stay hotel are quite same like other hotel properties.